After the discovery of the Higgs boson, CMS observed its interaction with some standard model particles like the bottom and top quark, the tau lepton, and the W and Z boson. Measuring the strength of interactions with quarks and leptons (called Yukawa couplings) is one of the important goals of the LHC. The values of the Yukawa couplings affect not only events where the Higgs boson is “openly” produced, but also events where particles exchange a virtual Higgs boson. For example, in the production of top quark-antiquark pairs there is a probability that a top quark would emit a virtual Higgs boson, and a top antiquark would absorb it, or the other way around (see Fig. 1). The virtual Higgs boson acts as a string between the quark-antiquark pair slowing them down and pulling them closer to each other. CMS searched for the subtle perturbation in the relative motion of top quark and antiquark and used this information to constrain the strength of interaction of the Higgs boson with the top quark, which is the most massive known particle. In proton-proton collisions within the LHC, top quarks are predominantly produced via interaction of two gluons (particles that hold quarks inside protons) as shown in Fig.1. Fig 1. A graphic representation of top quark-antiquark pair production with a virtual exchange of a particle Γ, which represents any boson of electroweak interactions, including a Higgs boson. According to Einstein’s famous formula E=mc2, the kinetic energy of motion of the gluons (E) is converted into the mass of a produced pair (m). The effect of a virtual Higgs boson exchange on the top quark and antiquark is most prominent at the production threshold, i.e., when the combined energy of the two gluons is just barely enough for this reaction to happen. In this case, the top quark and antiquark are moving very slowly with respect to each other and have an increased chance of exchanging a "handshake" in the form of a Higgs boson. This probability should increase with a higher value of the top Yukawa coupling, consequently improving the chances of producing top quark-antiquark pairs that are moving slowly (see Fig.2 left) and with a smaller angle between the two quarks (see Fig.2 right). Thus, to observe the effect of the Higgs boson on the top quarks' motion, it is essential to examine many LHC collisions when the top quarks are produced (almost) at rest and measure the angle between the top quarks as accurately as possible. Fig 2. Probability of the top quark-antiquark production vs kinematic properties of the system for different values of the top Yukawa coupling (Yt=0,1,2,4). Left: Invariant mass of the system (lowest value of this variable corresponds to the production threshold). Right: Rapidity difference between top quark and antiquark (this variable is related to the angle between the two particles). The narrow bands around the lines indicate the variations of the prediction with the top quark mass. Top quarks are not detected directly but instead reconstructed using their decay products: leptons and jets (see Fig. 3). 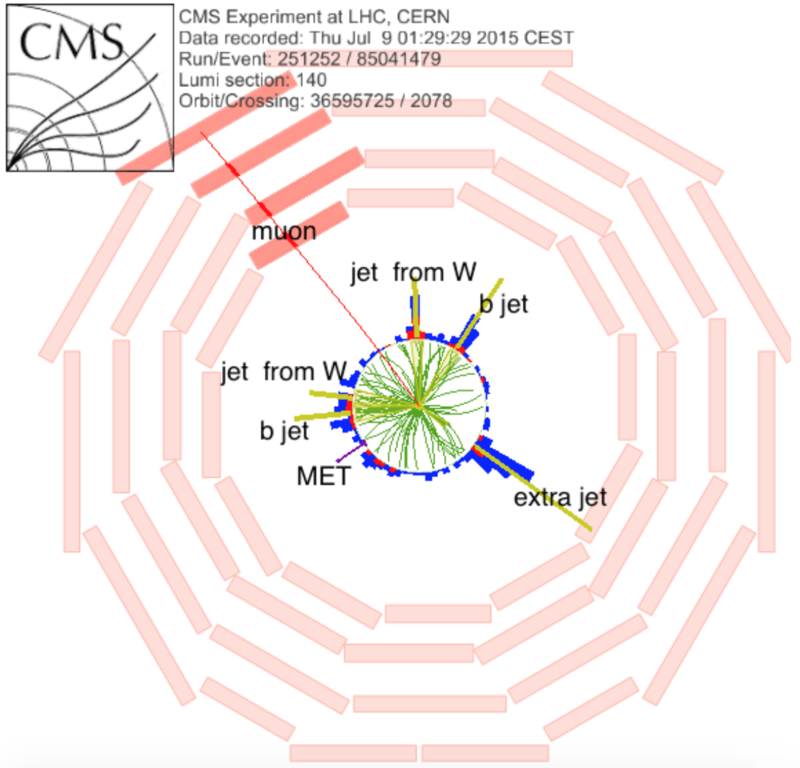 When the top quarks are barely moving their decay products are not very energetic, and some are not detected by the CMS detector. Figure: Display of a top quark-antiquark production event. Each top quark decays to a b-jet and a W boson. One of the W bosons decays to a lepton (in this case a muon) and a neutrino, which manifests itself as a missing energy in the detector (labeled MET). There are also two jets from the other W-boson decay. Just like many other collisions at the Large Hadron Collider, this event also contains an extra additional jet. This makes such events particularly difficult to reconstruct, which was the primary challenge of this analysis. CMS physicists developed a novel technique that allows recovery of events that have lost some information in the form of a missing jet from a top quark decay. This method significantly enhanced the sensitivity to measure the Higgs boson exchange. This analysis constrains the ratio of the top quark Yukawa coupling to the standard model and finds that within experimental uncertainties the behavior is consistent with the standard model predictions. The advantage of using this method is that there is no need to make assumptions about the strength of Higgs coupling with any particle other than the top quark. This is the first time that such a technique is used; previously it was thought that such measurement would only be possible using future electron-positron colliders, where the energy of colliding particles will be known with much greater precision.